All players form a single team. In the rst round (level 1) each player receives 1 card, in the second round (level 2) they receive 2 cards, and so on. At each level the team members must put down all their cards in increasing order in the centre of the table on an open stack, one after the other. For example (4 players, level 1): 18-34-41-73. The players do not take turns in any particular order. Whoever wants to put down a card, simply does so. Watch out, here’s where it gets interesting: the players must not disclose anything about their own cards - no sharing of information, no secret signals. So how does it actually work? Concentration please: each player who is ready to tackle the current level places one hand palm down on the table. Once everyone is ready, they remove their hands from the table and the game begins. Note: this collective concentration on the level is vitally important for successful survival! As the game progresses, players are permitted to refocus their concentration at any time. Simply say “stop” to interrupt play – everyone places a hand on the table – refocus – remove hands – and the game goes on! • The cards which the players hold in their hands must be placed in the centre of the table in ascending order. The lowest (available) card must be put down rst, then the second lowest (available) card must be placed on top, and so on. The cards are always put down one at a time. If a player has, for example, the 36 and the 37 in their hand, they may play them immediately one after the other – but they are put down one at a time! The players do not take turns in any particular order. Whoever believes they have the lowest card currently available, simply plays it. Very important: none of the players is permitted to disclose any of their card values or show them to another player. There must be absolutely no consultation between the players, and no secret signals either! • If the players place all their cards in the correct sequence (in ascending order), they have completed the current level! I played a 3p game of The Mind once on a game con, read about it that it had a lot of rave. Well, there is a deck of 100 cards numbered from 1 to 100, and you get one, say 3. You know the other gamers have a different card. You are supposed to read each others’ minds but not really, and play the cards in a rising sequence. If a player looks away as if not in the mood you can infer he has a high number and intends to go last. If some player is eager by placing the facedown card near the (initially empty) pile, you can infer he has a low number. Because of the 1-100 range the first round is usually quite clear who must go first and who is next. Second round each gets 2 cards, so in a 3p game the 6 cards must be placed in increasing order. If you get two cards with numbers near each other it is easy to signal that if you played one you intend to go immediately after that; but say you have cards 43 and 62 it becomes a bit less clear. Next round, each draws 3 cards and so on, until 10. If someone fails everyone loses and you note your high score (#rounds). There are a few levels where you get an extra life, but it’s basically all there is. It’s simple to set-up, provided you shuffle well, but it’s themeless and while you can play it on-the-go, you probably won’t. It’s a gimmick that may grow stale less with children, but it’s not for gamers. Then again, there are far more games that children will like. 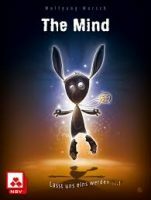 Add a Review for "The Mind"